Tanda’s new offspring – her fifth – weighed 50 kilograms at birth. 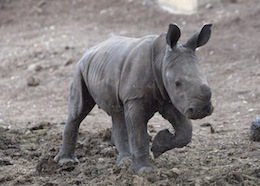 The baby rhino’s horn will begin to grow in the coming weeks, but, in its first year, the horn will remain small and round. Due to poaching in other areas of the world – for the rhinos’ horns – several species of rhino have become endangered. In one case, the northern white rhino has been almost completely wiped out, with only five animals left in captivity. The safari park tries to encourage breeding programs, particularly of endangered species, and has seen some success.